Thanks to HarperTeen, I'm giving away a finished copy of Father Of Lies by Ann Turner. Fourteen-year-old Lidda has always known she was different. She longs to escape Salem Village and its stifling rules—to be free to dance, to sing, to live as she chooses. But when a plague of accusations descends on the village and witch fever erupts, L idda begins to realize that she feels and sees things that others can't, or won't. But how will she expose the truth without being hung as a witch herself? 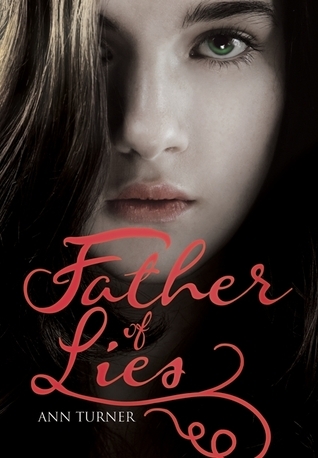 *One person will win 1 finished copy of Father Of Lies by Ann Turner. *Contest open to US residents only.If you have a friend in the US I will be happy to send to them. *Contest ends March 20th, 2011. *Winner will be announced on the blog and informed by e-mail.If I don't hear back from you within 2 days, I will pick a new winner. *Comments will not count as entries, but feel free to leave one. Fill out this form HERE to enter. A huge thank you to everyone that entered the competition! Winner has already been contacted and has replied. This post will unfortunately end on a more sour note, as I am announcing the end to the tour-side of this blog. Yeah, it's sad. Unfortunately, I don't have that tough a skin and I don't like it when people call me names on their emails. Especially when they know they're wrong. I won't refer to any specific incident, but I assure you there were a lot. I guess being an unpopular blogger automatically puts a target on my back saying "Here, prey on the weak". I bet these people would never pull stuff like that if they participated in other bloggers' tours. Anyway, I shouldn't care what they do, because I don't really care for them as individuals. Thing is, they ruined the whole thing for the rest of you, who've been nothing but supportive and kind. Yes, making a tour-blog equals hard work, vast knowledge of the books that are coming out and of course an enormous amount of stress. Honestly, I wouldn't mind that if I had to deal with polite and caring people. But seeing how some people out there can't be kind, polite, or caring even if their lives depended on it, I can't go through all this, just so they can do their thing. I am well aware what a move like that will cost me, but I'm really really sorry, I just can't. Tours that are already ongoing will continue as planned, of course. Thanks for the amazing contest! I'm so sorry that people were so rude to you. It stinks that there are inconsiderate people in the world, but there are. Thanks for trying to out though! Aww noo! I wanted to donate some ARCs. I'm sorry some ppl have treated you badly. :( I really enjoyed your book tours. Thanks for all that you've done! I'm sad that the blog tour is ending, since I've only recently been a part of it. I want to thank you for the opportunity to read wonderful books that I might not otherwise have been able to read. I'm sorry that it has to end on a sour note for you, but know that some of us were truly grateful for the work you put into the tours! I'm sorry to hear about this! I've just recently joined the tour site and I've really enjoyed it... so I'm utterly sad to see it go! Thank you for the opportunity to read and share some awesome books with others! Aw, that's sad about the tours. They were fun. But I completely understand, no one should have to put up with that kind of rudeness. I'm sorry that happened to you. There's no excuse for calling someone names, especially when what you were doing was generous. Thank you for having the tours, though, I'm glad I got a chance to participate in some of them! Thanks for all the great tours you've done! I'm sorry that you had to deal with unpleasantness. That is just NOT COOL! I appreciate all the hard work you put in.